Space Station tour: Commander Sunita Williams shows you her orbiting home. Expedition 33 Commander Sunita Williams aboard the International Space Station. 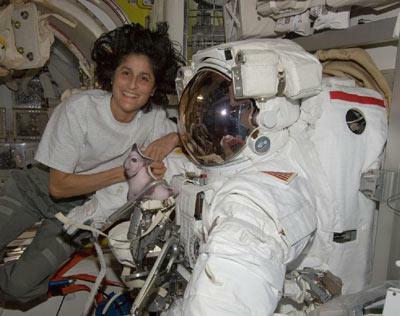 Before she came back to Earth in a ball of fire surrounding her Russian re-entry capsule, astronaut Sunita Williams took time out of her packing for the trip home to give a nickel tour of the International Space Station. When I clicked this, I figured I’d watch for a minute or two … and found myself watching the whole thing, because it was simply fascinating. What struck me the most was the paradoxical nature of the station itself. It seems so cramped, yet at the same time the ability to move in three dimensions makes it seem almost roomy. I knew this intellectually; I’ve been reading science fiction my whole life, and I can’t tell you how many authors describe that very situation. But to see it through the eyes and words of someone actually living there is amazing. The ISS is pretty big—a hundred meters across its longest dimension—but following along with her as she sails down the long passageways makes it really hit home. I also was drawn in by the personal touches. The crescent moon on the bathroom door had me laughing out loud, and the stickers everywhere were cool. If weightless acrobatics are your thing, Williams rotating around to show how to go into the four-pronged cross-shaped sleeping quarters should make you happy. Also, fluffernutter? I hope she keeps that under tight control. That would make a mess if it got loose. That’s also how you get ants. I know the video’s long, but if you have the time I do suggest watching the whole thing. I have very mixed feelings about the space station; it cost a lot of money, and in my opinion it hasn’t lived up to the scientific potential NASA promised when it was being designed. But watching this video reminded me of the good that’s come out of it: There is science being done there; we’re learning how to design and build hardware for long-term space travel; we’re learning just how to live in space (and NASA just announced it will be sending humans into space for an entire year, an unprecedented experiment); and we’re finding new ways for nations and individuals to cooperate in space. Don’t just dismiss that last bit. I grew up in the Cold War era, so seeing Russians and Americans working together in space—where they were once stone-faced enemies with their fingers on The Button—makes me wonder what good we humans can do when we see our similarities more than our differences and really focus on the long goals.